Two words are sure to strike fear into homeowners living in the Dallas / Fort Worth metroplex: Slab leaks. Here in DFW, our houses are often built on “floating” concrete slabs over clay soil that expands and contracts with fluctuations in moisture and temperature (i.e., our seasons). As our foundations and the pipes built into them settle and age, the chances increase that at some point one of those pipes will spring a leak. To help our North Texas neighbors out, we provided a list of important things to consider to help avoid a slab leak under your home. According to the website Esurance.com, whether a slab leak, or any of the issues that arise due to a slab leak, are covered by your homeowners policy comes down to the concept of “covered peril.” A peril is simply the cause of any loss, such as a fire. If a covered peril results in a slab leak that causes further damage to your home, you’re likely (although not guaranteed, as some exceptions may apply) covered for damage to your home’s structure and personal belongings such as electronics, clothes, furniture, and more. The fine print is important, however. Where your standard homeowners insurance will often cover the costs involved with tearing out and/or replacing the slab to fix any plumbing issues, most policies don’t cover the plumbing problems themselves. So, if your plumbing fails for most of the causes listed above like normal aging or tree root damage, you may have to cover the repair costs yourself. In addition, most homeowners policies don’t kick in until your home is actually damaged by the slab leak; if you catch potential leaks early, your policy might not cover the costs of inspection and repairs. Clearly, your home and belongings are best protected through a thorough understanding of your policy and coverage. Make sure to visit with your agent periodically and run through some scenarios to test out the provisions of your specific policy. Now that we’ve put the fear of time and nature into you, let’s consider a few easy steps you can take to help avoid slab leaks, as well as the hassle and expense they cause. 1. Keep an eye on your landscaping, particularly tree roots. If any appear to be in any danger of disrupting your foundation, consult immediately with a landscaper or arborist. 2. Know the limitations of your home’s plumbing system, and maintain a water pressure that is appropriate for your pipes. 3. Likewise, carefully consider the chemicals you put into your pipes. Some declogging agents, for instance, are so harsh as to be detrimental not only to the environment, but to the plumbing they are meant to clean. 4. Have the pH of your water tested. If your water is too “hard” or “soft,” it could damage your pipes over time and eventually cause leaks. Now let’s consider how to avoid leaks caused by Texas’ infamous clay soil. The key is to keep the soil-moisture level around the outside edges and corners of your foundation fairly consistent. The Texas A&M AgriLife Extension Service suggests looking for any gaps between the soil and your foundation. If there is no gap, your moisture level is good; but if you see a gap, keep these tips in mind. 1. Minimize rainwater falling off the roof at your foundation’s edges. a. Use rain gutters and downspout extensions to move the water out into your yard and away from your foundation. Three feet is the minimum safe distance. b. Keep the gutters cleaned out to eliminate overflow. 2. During hot and dry weather, water your foundation to maintain soil moisture. Check your city’s drought and water emergency plans so see what form of foundation watering is allowed. a. Your home’s sprinkler system may already be set up to do this; if so, make sure the settings are optimized and legal. b. If your home doesn’t have a sprinkler system, use soaker hoses on automatic timers to achieve the same effect. 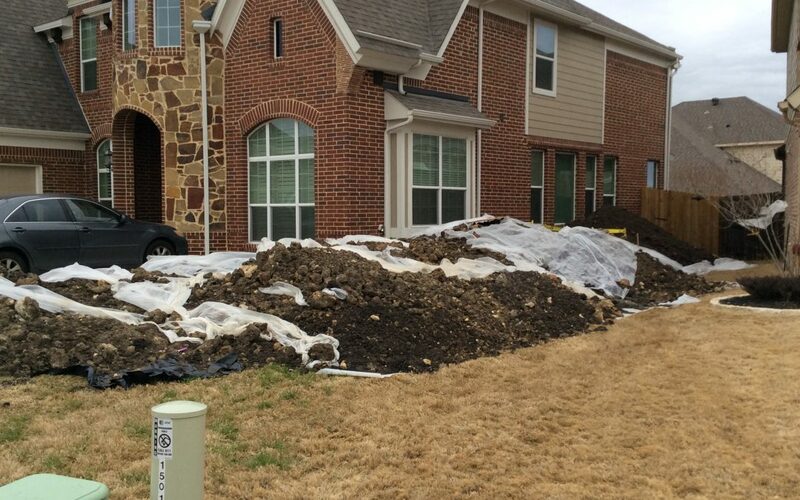 Even moreso than the scorching Texas summers, the erratic nature of Texas winters can play havoc with your foundation. Here are some ways that cold-weather maintenance can protect your foundation and your home. 1. Clean out those gutters again, this time to eliminate any trapped water than can lead to damage caused by ice expansion. a. Unhook and drain all hoses. b. Insulate spigots and any exposed pipes before and during any freezing temperatures. 3. Repair any damage or leaks in your sprinkler system. Even after your best efforts to prevent it, a slab leak may still happen; it probably goes without saying that the longer you wait to repair it, the more damage is done. If you suspect that your home has developed a slab leak, contact us right away! We have 30 years of experience fixing slab leaks in the Metroplex, and our specialized repair process leaves nothing but a scratch in your yard. You can quickly schedule an appointment online, and our slab leak estimates are always free (plus, unlike most plumbing companies in DFW, we do not charge a “trip charge” or “diagnostics fee”).